Staff, patients and visitors are being urged to be on the look-out today for a giraffe lost somewhere in Castle Hill Hospital. 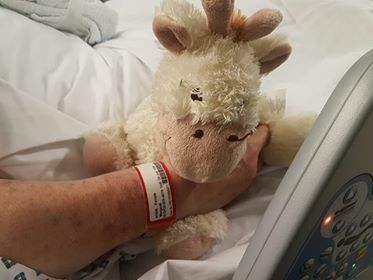 Margaret Atkin, 78, was given the toy giraffe by great grandson Jacob Rider, four, when she was admitted to the intensive care unit at the hospital in Cottingham nine weeks ago. The soft toy, which doesn’t have a name, had a rip in its back and intensive care nurses used surgical tape to seal its ‘wound’ before Mrs Atkin was transferred to Ward 27 as her condition improved. However, the giraffe was lost when Mrs Atkin was moved onto Ward 29 on November 22 as her recuperation continues. Now, Jacob’s mum Kirsty is appealing to staff and anyone visiting patients at the hospital to be on the look-out for the giraffe. She said: “Jacob asked where the giraffe was at the weekend and I told him it was still in hospital getting fixed. The family contacted the cleaning firm responsible for the hospital’s laundry but it hasn’t been found. They have checked lost property, the general office at Castle Hill and both wards without success. They’ve also walked between the wards in the hope of finding the giraffe but it hasn’t turned up. Hull University Teaching Hospitals NHS Trust is emailing all staff to alert them to be on the lookout for Jacob’s giraffe and is now asking visitors to the hospital to keep their eyes peeled. Anyone who spots the giraffe is urged to contact the communications department at Hull Royal Infirmary on 01482 675556.